Lung cancer is the leading cause of cancer death among men and women, according to the American Cancer Society. More people die of lung cancer each year than of colon, breast and prostate cancers combined, the ACS said. In 2012 in the United States, there will be an estimated 160,340 deaths -- 87,750 men and 72,590 women -- from lung cancer, accounting for about 28 percent of all cancer deaths, according to the ACS. In recognition of Lung Cancer Awareness Month this November, we asked Dr. Gregory Colangelo, MD, FCCP with Mercy Health -- Pulmonary and Critical Care Consultants of Fairfield, and the medical director of the intensive care unit at Mercy Health -- Fairfield Hospital , to bring you the facts on lung cancer. Q: November is Lung Cancer Awareness Month. Why is it important for people to be educated about lung cancer? A: "Lung cancer is the leading cause of death for all types of cancer in both men and women. Lung cancer is also the most common type of cancer worldwide. In the United States, there will be over 200,000 new cases of lung cancer diagnosed in 2012 with over 160,000 deaths from lung cancer in 2012. Frequency of lung cancer continues to increase." Q: What is lung cancer? A: "Lung cancer is a malignancy of lung tissue which originates within the airways or within the lung parenchyma." Q: What are the types of lung cancer? A: "There are several types of lung cancer. Lung cancer can be roughly divided into small cell lung cancer and non-small cell lung cancer. It is important to characterize non-small cell lung cancer as completely as possible because this will affect the treatment options. There are several types of non-small cell lung cancer, including squamous cell lung cancer, adenocarcinoma and large cell lung cancer." Q: Who is most likely to get lung cancer? A: "Cigarette smoking is responsible for in excess of 90 percent of cases of lung cancer. ... Secondary smoking has also been established to be a risk factor for lung cancer." Q: What are the causes of lung cancer? A: "Other associated conditions thought to increase the likelihood of lung cancer include pulmonary fibrosis, asbestos exposure in smokers, exposure to radon, HIV infection and potentially genetic factors." Q: What are the symptoms of lung cancer? A: "Unfortunately, there (are) very few early symptoms of lung cancer which warn the patient or the physician of the condition. However, once lung cancer is advanced, the lesion may obstruct major airways causing collapse of the lung and shortness of breath. (A) cough is also a major symptom and may be associated with hemoptysis (coughing up blood). Lung cancer can sometimes involve the chest wall or spine causing pain. Oftentimes, the first sign of lung cancer comes from symptoms of metastasis (spread to other organs). Common sites of metastasis include liver, adrenal glands, bone and brain. Lung cancers may also secrete a number of hormonally active compounds causing paraneoplastic syndromes which may also produce symptoms." Q: How is a person diagnosed with lung cancer? A: "A diagnosis of lung cancer is suspected many times from imaging studies such as (a) chest X-ray or CT scan of the chest. Diagnosis requires biopsy with pathologic examination." Q: How is a person treated for lung cancer? A: "The treatment options for lung cancer include surgery, radiation and chemotherapy. 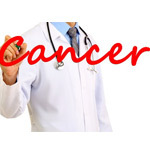 The decision about the type of treatment is dependent upon the type of lung cancer and its stage." Q: Is it possible to prevent lung cancer? A: "The most effective preventive behavior for lung cancer risk reduction is to avoid either primary or secondary cigarette smoke." Q: What else would you tell people about lung cancer prevention? -- In 2012 in the U.S., approximately 226,160 new cases of lung cancer will be diagnosed -- 116,470 men and 109,690 women. -- In 2012 in the U.S., there will be an estimated 160,340 deaths from lung cancer -- 87,750 men and 72,590 women, accounting for about 28 percent of all cancer deaths. -- Lung cancer is the leading cause of cancer death among men and women. -- More people die of lung cancer each year than of colon, breast and prostate cancers combined. -- Approximately two out of three people diagnosed with lung cancer are 65 or older. -- Less than 2 percent of all lung cancer cases are found in people younger than 45. -- The average age at the time of diagnosis of lung cancer is about 71. -- The chance that a man will develop lung cancer in his lifetime is about one in 13. -- The risk that a woman will develop lung cancer in her lifetime is approximately one in 16. -- More than 350,000 people who are alive today have been diagnosed with lung cancer at some point.